Select “Browse Facebook on a secure connection (https:) whenever possible. Press the Save button, log out and then the next time you log back in, you will be using the platform securely. It’s a good idea to use Facebook in the secure mode if you ever browse in public locations like libraries or coffee shops. If you web traffic is not encrypted then it can be intercepted by anyone within wireless range of you computer using some off the shelf web traffic tools. To see the content, you’ll need to turn off your Account Security and browse in uprotected mode. Pressing the Continue button turns off secure browsing and lets you view the content of the page or App. If you are a web developer, read on to find out what you need to fix in your app. Still with me? Great. First a little back story; Facebook apps originally developed in an extended version of html called FBML. Facebook is phasing out FBML and replacing it with iFrames. iFrames offer a lot more flexibility, but also through more complexity in the mix. Especially if all you want to do is make custom welcome screens and gates for new fans and followers of your page. 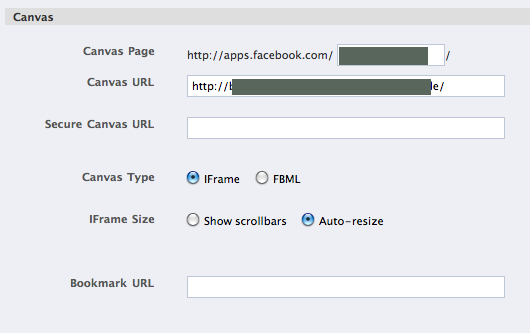 Facebook’s iFrame Apps require you to host your content and html on an outside web server. This is fine for a regular http: connection, but when the user goes into https: mode the content will not display unless you have a valid SSL security certifcate. In order for your app to display content over the https: protocol, you will need to get a security certificate for your server and domain. There are many different certificate providers out there such as Geotrust, Thwaite, and Verisign. The easiest way to get a certificate is to order it from the company that does your hosting. Then they will do the configuration of the certificate for you. Once you get your certificate configured for your domain and server, you will need to add your secure web address to the Facebook App’s secure canvas URL (use the https: protocol). The Canvas URL will still have the insecure web address. Save the settings for the http: and https: locations of your Apps and your page’s fans will now be able to view content regardless if they are in the regular browsing or secure browsing modes. Getting the SSL certificate and implementing the changes to your App will ensure that your Facebook App users will have a positive browsing experience. NextMS Graphic Design Grand Opening Celebration!